Six months prior to being referred to Dr. Escalante, this female patient hyperextended her ring finger. 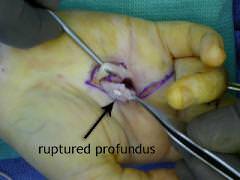 Prior splinting had not been successful in reducing her contracture and she presented with a 90º flexion contracture of her ring finger PIP joint. 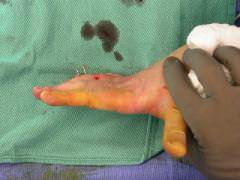 It was decided to use a Digit Widget to treat the contracture. Nine weeks after the device was installed, the contracture was corrected to nearly full extension. 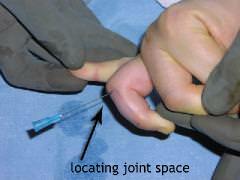 However, when the elastic band tension was removed, the joint would lose extension within a few days. After 14 weeks of wearing the device, the patient had exploratory surgery in her palm. Bone pins were left in the middle phalanx. Exploration of the flexor tendons revealed a rupture of the FDP tendon, with adhesions to the FDS tendon. Dr. Escalante performed a tenolysis and the FDP was excised. This case illustrates how the Digit Widget can assist in revealing the underlying etilogy of a PIP contracture. As the joint moves throughout a more normal arc of motion, the cause of the contracture can be more easily identified. 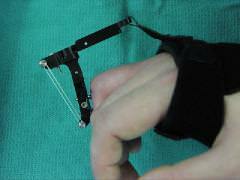 The Digit Widget was worn for another four weeks and her final PIP motion was 30 – 90º.